The Apple iWatch a device that is a must have for any work out and dressy enough for the everyday occasion. Its lightweight aluminum case design makes it hardly notable on your wrist and stylish bands that are interchangeable in many different styles. The aluminum case and sapphire cover is also more resistant to damage and scratches. This item has been refurbished at a manufacturer approved repair center, it is in EXCELLENT condition in original Apple packaging. If you are not 100% satisfied we offer a 30-day money-back promise. Includes Apple Watch, Magnetic charging cable (2 m), USB power adapter (5W), Sport Band (includes band that can be configured for either S/M or M/L length), Quick start guide. Manufacturer's warranty is not included. 1.5-inch touchscreen display with a resolution of 340 pixels by 272 pixels at a PPI of 290 pixels per inch. 8GB of internal storage that can not be expanded. MP3 Player, Photo Viewer, Voice Dial/Commands. 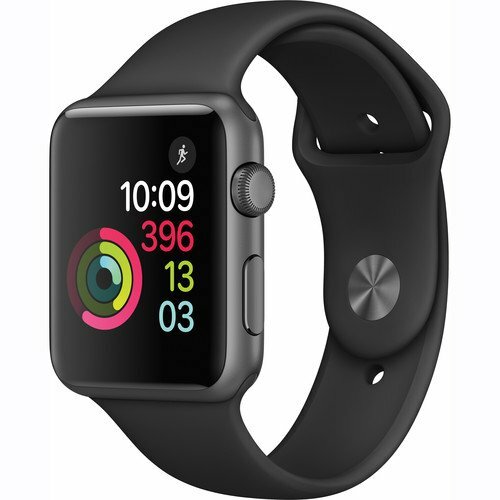 Includes Apple Watch, Magnetic charging cable (2 m), USB power adapter (5W), Sport Band (includes band that can be configured for either S/M or M/L length), Quick start guide.